When I was in my final trimester my physician diagnosed me with symphysis pubis dysfunction. This was incredibly uncomfortable and made it very difficult to roll over in bed, walk, and sit down. This is due to excessive movement of the joints in the pelvis in response to the hormones released during pregnancy. I found the only place comfortable to sit was on the birth ball. I feel it helped support my pelvis and allowed the baby to get into position. Eveb during labour, its the only place I could sit. I believe that I dilated faster because I was able to find a comfortable place sitting on it. Join in and write your own page! It's easy to do. How? Simply click here to return to Birth Ball Tips. The birth ball is FUN! Now that I've given birth to a beautiful baby girl, I'm always bouncing on it. She loves it too. It's the best way to quiet her down and it saves my husbands' knees. I'm really looking forward to getting back to exercising, and getting my abdominals back. I'm going to see my doctor this week to get clearance to start some of the exercises on this website. The birth ball helped me tremendously. From the very beginning I didn't want any drugs to deliver my baby, but my doctor told me I had a streptococcus infection and would require some antibiotics. One night after a hectic day of rushing around trying to get ready for my maternity leave I woke to find I was bleeding. I quickly called my sister who is a nurse and she said that the baby will probablty coe within the next couple of days, but that I should call the hospital just to make sure everything is OK. They called me into the hospital and determined that my water had broke. I didn't even notice. I was expecting something much more dramatic. They hooked me up to an IV and my huband went back home for my suitcase full of clothes. I didn't even know I was in labor until I noticed that the pains I was getting from the doctors inducing me were similar to the pains I was already having...ONLY WORSE! They rolled in a birth ball, but I had no idea what to do with it until a nurse came in with some experience around the ward and a couple of other moms-to-be. Just sitting on the birth ball seemed to ease my discomfort tremendously. I only wish I had had some advice on how to use this thing prior to going into the hospital. The other women showed me how to sit, rock my pelvis, squat, and my husband would massage me at the same time. Then my active labor started so I kicked everyone out except for the nurse my friend and my husband. My husband was a great coach and my friend gave me foot massages. They made a great team. i have to say, long story short (ok not so short), the birth ball and some great support allowed me to give birth without painkillers. now I have an 8lb 3oz beautiful health son named Jayden!!!! yeah! I'm a nurse from the UK and thought I could add some tips about posture during pregnancy. Slouching back into soft couches or car seats will not only put pressure on your lower back but can encourage your baby to face forward. Any position that causes you to lean back and your knees are higher than your pelvis are best avoided. You should also avoid deep squats until you're sure your baby is facing the correct way because this will open up the pelvis and encourage the child to move down. Don't cross your legs as this reduces the amount of space in the front of the pelvis. To get into a good position your child needs lots of space. Don't lie back and put your feet up as this will encourage a posterior presentation. A birth ball is definitely a great way to encourage good positioning of the baby before and even during labour. While people kept telling me that labor pain was going to be the most painful thing I'll ever experience,I had nooooooo idea what I was in for! This child was not going anywhere anytime soon. After 24 hours in labor someone finally rolled in an exercise ball. i seemed to just instinctively know what position I needed to be in to help relieve the pain and get things going. Thank god for the ball. I just wish I'd discovered this website a month ago! Even during labour, the birth ball is a good tool. Get your birthing partner to sit on a stable surface like the edge of the bed or on a sturdy chair. Place the exercise ball between your partner's legs and you sit on the ball. This position allows you to lean back into your partner and relax and concentrate on breathing. In this position you get the comfort of the birth ball and any areas that need pressure or massage are easy to get to by your partner. Back pain during labor and contractions is a huge fear amongst women who are expecting their first child. 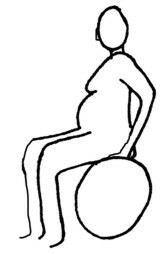 You can help ease this with correct positioning while sitting on the birth ball. I'm a Doula from the US and I'd like to add that it is helpful that when siiting on the ball, you keep your pelvis about 4 inches above the level of your knees. This position helps keep pressure off your lower back and helps bring the weight of the baby forward. Of course also keep feet flat on the floor. By the way - I love your website.